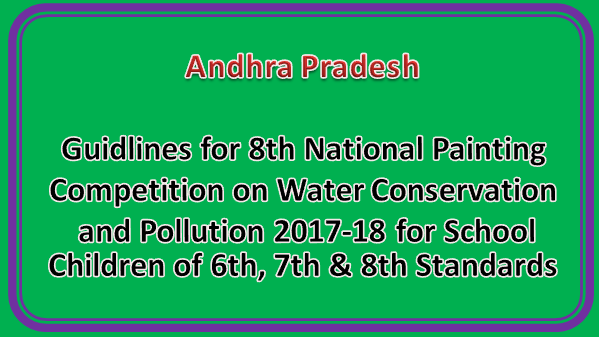 The Ministry of Water Resources, River Development & Ganga Rejuvenation is conducting 8th Nationwide Painting Competition on Water Conservation & Pollution for Students of 6th, 7th and 8th Standards to make the children aware about the need of conserving and protecting this precious resource and at the same time involving their parents and teachers in this noble cause. The Painting competitions will be held in three stages. Namely School, State and National Levels. The following are the GUIDELINES FOR SCHOOL LEVEL COMPETITION. It is mandatory for all Participants to have Aadhar Card. The School level competion is for the students of 6th, 7th and 8th standards only. The for painting competition is USE WATER WITH MORE CARE - SAVE OUR FUTUR GENERATION. School Principals/Head Masters are requested to organize painting of 2 hours duration at their school on any date before 15-12-2017.